 How did Americans respond to the shifts in economic and political power that occurred during this period? As this sample of images and the title of Frank Norris's novel suggest (see Text 3), in late nineteenth-century America the octopus seemed, metaphorically, to be everywhere. Of course, this octopus was not the sort you might snag while deep-sea fishing. It was decidedly a land creature, malevolent, imbued with rationality, purpose, and unbridled appetite. Why did this image resonate so deeply within the popular imagination of the era? It was due to the growing awareness of the extent to which large, centralized, interlocking networks of distribution, organization, and administrationfrom railroads, to power grids, to corporate hierarchies, to political machineswere shaping American life. Trapped in such systems, American sensed a lessening of control in nearly every sphere. For our purposes the specific local conditions to which these images refer are irrelevant. What matters is their interpretation of power and powerlessness. 6 pages. 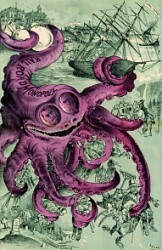 Throughout the period cartoonists portrayed the Standard Oil Company as a giant, grasping octopus. Its principal founder John D. Rockefeller got into the oil refining business in 1863. He soon expanded his company by bringing together five refineries into the firm of Rockefeller, Andrews, and Flagler. In 1870 he established the Standard Oil Company of Ohio and embarked upon a strategy of buying up rivals and consolidating all oil refining under one company. His business practices led to a successful antitrust suit filed by the Ohio attorney general in 1892. They also led to Ida M. Tarbell's famous muckraking exposé of the company. Tarbell joined the staff of McClure's Magazine in 1894. After writing a popular series on Abraham Lincoln, she turned her attention to Standard Oil, the company that had forced her father out of business. In a series of articles from 1902 to 1904 she revealed the machinations through which the company achieved its monopoly, especially the rebate deals it worked out with various railroads. In 1904 the articles were collected as The History of the Standard Oil Company. Rockefeller's Random Reminiscences is in part a direct response to Tarbell's work. Through opposing viewpoints we have condensed the argument between Tarbell and Rockefeller. She accuses him of building his company through "hard dealing, sly tricks, [and] special privileges." He maintains that his company expanded through a series of logical steps dictated by market growth. In 1911 the U.S. Supreme Court said Tarbell was right. 5 pages. During this period the railroad became the nation's chief symbol of power. Railroads acquired vast economic might, amassing huge amounts of capital and providing their owners with unprecedented fortunes. They reached deeply into the daily lives of citizens as they rationalized business practices, set rates, controlled transport, and even defined the time of day through the establishment of standard time zones. They determined government policy and by virtue of their size eventually came to rival the government as a force in American life. Not surprisingly, Americans of this period exhibited ambivalent attitudes toward them. As we saw in the MEMORY section of the toolbox, they viewed railroads as agents of unity and healing after the bloody divisions of the Civil War. Moreover, they were a source of pride, for railroads, like the Brooklyn Bridge, displayed the nation's technological prowess. Yet they also engendered bewilderment and fear. Their power threatened rights, corrupted government, and contributed to the sense that people were losing control of their lives. The railroad was an octopus. It was also "The American Frankenstein." As powerful as a force of nature, the railroad was an apt subject for Frank Norris. Born in Chicago in 1870, his family moved to San Francisco in 1885. He attended the University of California, Berkeley, where he became particularly interested in the ways natural forces influenced human thought and behavior. While he pursued a career as a novelist, he supported himself as a journalist and was for a time on the staff of McClure's. His novel The Octopus: A Story of California was the first of what Norris planned to be a naturalistic three-part "Epic of the Wheat." Only two volumes were published, The Octopus in 1901 and The Pit in 1903, a year after he died. The "hero" of the trilogy was to be the wheat itself, representing nature's indomitable power. From The Octopus we offer four excerpts. In the first, the poet Presley discovers inspiration for his art while riding his bike through the rich farmland of the San Joaquin Valley. His West has more in common with Owen Wister's than with Albert Bierstadt's, although he does experience what might be called the agricultural sublime. (See MEMORY.) Like Wister's, it is home to a displaced natural aristocrat from the South, a farmer named Mangus Derrick. In the second excerpt, Derrick, the most respected man in the Valley, and his son Harran encounter S. Berhman, the railroad's agent, and discover that the railroad can leave even powerful men unable to control their lives. In the third, the railroad's villainy drives Mangus to assume the leadership of The League, the farmers' alliance that has already bribed government officials to fight the railroad. Finally, we see the toll the bribe takes on Derrick. 17 pages. "A vast conspiracy against mankind has been organized on two continents," wrote Ignatius Donnelly in the National People's Party platform, "and it is rapidly taking possession of the world." Donnelly was referring to the consolidation of economic and political power that was victimizing farmers and workers alike. In response to this consolidation farmers formed alliances, workers' unions. Although the fit was not perfect, the two joined forces in 1892 to form, in Omaha, the National People's Party. According to the populists, greed and privilege had upset the balance between work and reward. Producers, who raised crops and made products, were being impoverished, while nonproducers, who raised rates and made deals, were becoming rich beyond reason. The Omaha Platform is the Party's founding document. Ironically, the year of the Party's founding was also the time of its greatest achievement. In the election of 1894 it lost control of Western states it had won in 1892. Fusion with the Democrats in 1896 cost the Party its identity and many of its supporters. Many of the Platform's proposals proved more durable than the Party itself; they were enacted as progressive reforms under Theodore Roosevelt and as elements in the New Deal. In the end the Party's cultural impact may have been more important than its political, for it articulated and legitimized an alternative way of seeing America, a vision more "real" because it emanated from "the people," as opposed to the "sham" version promulgated by the major parties. 3 pages. In an era of widespread labor unrest and numerous and violent strikes, the Pullman Strike stands out. George Pullman, president of the Pullman Palace Car Company, built for his workers a model town that offered them amenities unavailable to most American workers at the time. The product of the new science of urban planning, it sought to inculcate values and shape behavior through the manipulation of the worker's living environment. It also sought to meld communal and corporate values. The Pullman Company controlled everything in the town. When, during the severe depression of 1893-94, George Pullman cut wages but retained the high rents in Pullman, his workers struck. For help they turned to the American Railway Union and its president Eugene V. Debs. Pullman turned to the General Managers Association, a group of railroad executives, who promptly fired all workers who struck in sympathy with the Pullman employees. Debs eventually declared a boycott against all Pullman cars, which brought a halt to rail traffic in much of the nation and impeded the flow of the mail. The executives appealed to President Grover Cleveland, who dispatched federal troops to Chicago, which resulted in the deaths of strikers and onlookers. Defeated, the workers returned to work. A federal conspiracy charge against Debs was dropped, but he served time in jail for ignoring an injunction against the strike. Richard T. Ely was an economist who taught at various universities and wrote widely on land use. His Harper's article describes the town of Pullman and attempts to measure its success as a social experiment. The workers' statement of grievances was delivered at the Chicago convention of the American Railway Union in June of 1894. The Company's response appeared in the Chicago Herald that same month. The editorial in The People, the Socialist Labor Party journal, suggests that the strike signaled to many a fundamental shift in the meaning of America. 18 pages. First published in The Saturday Evening Post, this story reflects many of the themes of this section and, indeed, of the entire toolboxthe struggle for power, class anxieties, labor unrest, professionalization, the role of women, and worry over lost vitality. (See EMPIRE.) The "Slot" is a literal and metaphoric divide, separating San Francisco's well-to-do from its working classes. Freddie Drummonda reserved, cool, inhibited sociologistventures across it to study the laborers who live there. He is a thoroughgoing intellectual, yet he once played football and boxed. He still possesses a powerful, athletic body that emerges as the hallmark of Big Bill Totts, his working-class alter ego, who enjoys the adrenaline, the drama, and the power he learns to wield in championing workers' rights. When Drummond as Big Bill falls in love with Mary Condona "graceful," "sinewy" labor organizer with "amazing black eyes"he realizes that he is in danger of having his alter ego take over his life. He decides to anchor himself safely north of the Slot by marrying the proper Catherine Van Vorst. In the story's violent conclusion, workers fight police, and the protagonist decides if he is Freddie or Big Bill. Good for use with students. 8 pages. - Lincoln Steffens, The Shame of the Cities, 1904, "Introduction and Some Conclusions"
Just as corporate capitalism lent itself to characterization as a malevolent, grasping monster, so, too, did politics. The Puck cartoon An English Country Seat . . . (see Text 1), for example, refers to the graft of Tammany boss Richard Croker, who used his ill-gotten gains to purchase Antwicks Manor, an eighteenth-century estate in England. The cartoon states his political philosophy, "I am in politics working for my own pocket all the time." His Tammany successor George Washington Plunkitt shared that view but expressed it perhaps a bit more discreetly, "I seen my opportunities and I took 'em." That remark was immortalized by William L. Riordan, a reporter who covered city politics for the New York Evening Post. Riordan befriended Plunkitt"Leader of the Fifteenth Assembly District, Sachem of the Tammany Society, and Chairman of the Elections Committee of Tammany Hall"and recorded his musings from Plunkitt's "office," a shoeshine stand in the New York county courthouse. In a straightforward, vigorous style, Plunkitt explains how to make money in politics, how to acquire and hold power, and why reforms fail. His comments about reform would not endear him to Lincoln Steffens. The son of a wealthy businessman, Steffens was born in San Francisco in 1866. He studied in France and Germany before graduating from the University of California, Berkeley. Embarking upon a career in journalism, he became one of the era's leading muckrakers. Between 1902 and 1911 he wrote sensational articles exposing government corruption across the United States. In 1904 he collected the articles he wrote for McClure's Magazine in The Shame of the Cities. Subsequent journalistic assignments in Mexico and the Soviet Union led him to embrace revolution and communism, but his enthusiasm for both had waned by the time of his death in 1936. In the introduction to The Shame of the Cities Steffens identifies what he sees as the sources of urban political corruption and offers a way to eliminate them. Business, the commercial spirit, the corruption of patriotism, political bosses all come under fire, but in the end he declares that "the spirit of graft and lawlessness is the American spirit." Yet he offers a way to channel that spirit to good ends. Throughout the introduction his tone wavers. At one point he mocks and expresses despair; at another he praises and expresses hope. In the end he calls his "little volume" a "record of shame and yet of self-respect." 26 pages. These selections visually capture the world Plunkitt lived in and Steffens described. Like George Bellows (see PEOPLE), both Sloan and Glintenkamp studied under Robert Henri in New York and drew for The Masses, a socialist magazine published from 1911 until the government suppressed it in 1917. Sloan (1871-1951)born in Lock Haven, Pennsylvaniataught himself to draw by copying prints by Rembrandt, Durer, and Hogarth. He studied with Thomas Anshutz (see PROGRESS) at the Pennsylvania Academy of Fine Arts and began his career as a staff artist for the Philadelphia Press. His work for The Masses displays a caustic wit, but his paintings are generally colorful and exuberant. He called them "bits of joy." Glintenkamp (1887-1946) was born in Augusta, New York, and studied at the National Academy of Design. His drawings appeared in a variety of publications. Voting Machines appeared in The Masses, and like others he did for that publication, is characterized by sharp irony. 2 pages. "Is it wicked to be rich?" challenges William Graham Sumner, a minister and political economist of the time. "Is it mean to be a capitalist?" Here we pair two clergymen-philosophers on these questions. What is right and wrong in the natural evolution of property and wealth? When excesses occur, do we do nothing or do we intervene? If we intervene, who or what does the intervening? To what end? These pieces from Sumner and Walter Rauschenbusch address the familiar issue of laissez faire vs. government intervention, and in addition reveal the emotive undercurrent in each man's position. Both were Protestant clergymenSumner an Episcopalian and Rauschenbusch a Baptistwho pursued advanced theological and economic studies in Europe. Both served as pastors in American churches before entering the academic worldSumner in political economy at Yale and Rauschenbusch in theology at Rochester Theological Seminary. Yet with these shared backgrounds they diverged on the ethical questions of capitalism and became leaders of opposing philosophiesSumner of Social Darwinism, Rauschenbusch of the Social Gospel movement. Citing the "piles of rubbish" written to vilify businessmen, Sumner defends the wealthy in his 1883 What the Social Classes Owe to Each Other. Businessmen should be honored for the very American characteristics of initiative and practical courage that result in better lives for alla benefit of "natural selection" applied to society. Natural law and the free marketplace will provide balance and fairness, not government. "We are a nation of backsliders," responds Walter Rauschenbusch, arguing that in the business age we have abandoned our dedication to equal rights and justice, announced in our Declaration of Independence. His 1912 Christianizing the Social Order illustrates the extent to which evangelical Protestant Christianity informed the era's critique of both capitalistic power and political corruption. A comparison of these texts illuminates the major ethical debate of this period. 10 pages. As noted above, after 1896 the People's Party disappeared from the national scene, but the positions it advocated lived on. They found a new champion in Theodore Roosevelt, who was able to enact some of them during his presidency. When Roosevelt's successor William Howard Taft turned out to be far more conservative than Roosevelt had anticipated, he considered running for the presidency again in 1912. On August 31, 1910, on a speaking tour during which he received considerable encouragement to run, he used the occasion of a park dedication in Osawatomie, Kansas, where John Brown had fought Missouri ruffians in 1860, to articulate an expanded vision of government's role in America's commercial society. He had been moving in the direction of what he called "the New Nationalism" during his second term, but his thinking derived fresh vigor and coherence from a book entitled The Promise of American Life. Its author Herbert Croly identified two basic strands in American politics: the Hamiltoniancharacterized by strong government, aristocracy, and special privilegeand the Jeffersonian, characterized by democracy, equal rights, and equal opportunity. Croly argued for deploying a Hamiltonian state to achieve Jeffersonian ends, and in this speech, so, too, does Roosevelt. 10 pages. As Pullman workers fought for decent wages and Populists demanded railroad regulation, African Americans looked for basic rights. They were not untouched by the coalescence of corporate and political power that was reshaping American life, as the Populist alliance of Southern black and white farmers indicates. Nonetheless, their real challenge was not so much to organize against the octopus but to find a way to participate in American democracy. The two most prominent black spokesmen of the day offered two different paths to power. Booker T. Washington urged blacks to reject political action in favor of hard work and racial uplift. To complement that strategy, he encouraged white employers, as in his Atlanta Exposition speech, to "cast down their buckets among my people," where they would find not workers of "foreign birth and strange tongue" but native-born Americans who would toil "without strikes and labour wars." W. E. B. Du Bois, on the other hand, agitated for direct political action. The two perspectives are clearly articulated in the letters offered here. In addition, we provide the Niagara Movement's Declaration of Principles, the denunciation of America's mistreatment of its black citizens that emerged from a meeting of thirty black leaders organized by Du Bois and held in Niagara Falls, Canada. Its statement on "Employers and Labor Unions" sketches the plight of black workers in the emerging capitalist economy. Neither Washington's strategy of accommodation nor Du Bois's of confrontation could halt the steady disfranchisement of black men. The waning of their political power placed new emphasis on the political culture black women had created through work in churches, civic groups, and aid societies. African American women, eschewing overt political motives and drawing upon the progressive rhetoric of the day, became brokers between white political power and the black community. The excerpt from Mary Church Terrell's address before the National Women's Suffrage Association suggests how successful they were in this role. Terrell was born in Memphis, Tennessee, in 1863. She graduated from Oberlin College in 1884. An ardent advocate of feminism and civil rights, she was the first president of the National Association of Colored Women. She died in 1954. 13 pages. For additional resources on African Americans and politics during this period, visit the POLITICS section of the toolbox "The Making of African American Identity: 1865-1917." "If Men Were Seeking the Franchise" is both a clever attack on anti-women's suffrage arguments and a reflection on the nature of power. In it Jane Addams imagines a parallel universe in which women rule, and men, denied political power, petition for the vote. Marshalling her arguments against letting such belligerent, irresponsible, greedy creatures like men share power, she touches upon many of the issues discussed in this section of the toolbox and looks ahead to the section on empire. According to Addams, power governed by a different sensibility would not have permitted industry to advance with complete disregard for worker safety, would not have exalted profit above all other concerns, and would not have rushed to war for uncertain reasons. She offers a vision of what society might be like if different values ruled. Addams further notes that the case she makesreasoned, coherent, and based on evidencestands in sharp contrast to the case typically made against extending the franchise to women. Marie Jenney Howe, a feminist writer and editor, satirizes the typical case in her monologue, which she wrote for the New York Woman's Suffrage Party. In it she spoofs the stereotypes that anti-women's suffrage campaigners deployed against the cause and along the way gets in a few good shots at mush-headed political thinking in general. At times you may think you are reading Mark Twain. A good text to use with students. 12 pages. The Curse of California, 1882. Drawing by G. Frederick Keller; published in The Wasp, 19 August 1882. The Bancroft Library, University of California, Berkeley: PHI-033766. Reproduced by permission. Copyright © 2005 National Humanities Center. All rights reserved.